A few weeks ago, I posted an article on which paint colors would increase your home’s sale price (at least for 2017). However, several of you were very interested in knowing which colors should be avoided – i.e the worst paint choices. Well, I prefer to only write positive articles. So, it took a little bit of considering, but I did finally decide to go forward with writing this up. Just keep in mind, as you read this, that this is purely a statistical analysis. It is, by no means, intended to suggest that these colors are ugly. Color is very subjective, and in the right design, any color can be beautiful. However, we must start somewhere. Therefore, I would say that you should avoid these paint colors when selling your home. If you have been dreaming about a kitchen with dark blue cabinets, but you are worried about whether or not they will look good, well worry no more. 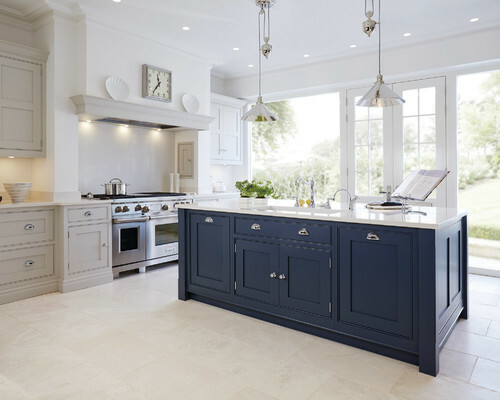 One of the biggest trends happening this year are navy cabinets – or some other incorporation of navy color into the kitchen. I already presented one of Pantone’s 2016 color of the year – Rose Quartz. Now, I want to take a look at their second choice – Serentity. It looks like Pantone has astutely noticed the rising popularity for blues in home decor. Serenity is a blue that we can all get on board with.